The Chinese New Year (often referred to as Lunar New Year or Spring Festival) falls on Feb. 3 this year and will be welcomed in Asian communities around the world. The occasion will be celebrated with two weeks of food, firecrackers, parades and traditional events designed to sweep away the old year and welcome in a new one filled with good fortune. Chinese zodiac-wise, 2011 is the Year of the Rabbit, and those born under this sign are said to be ambitious and lucky. 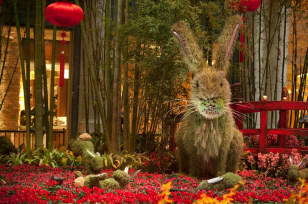 It's also why guests visiting the elaborate garden display at the Bellagio hotel in Las Vegas will be greeted with an 18-foot-tall God of Prosperity and a 12-foot tall hare with a coat made from 4,500 plants. “We provide guests with a wow factor at every point of contact,” said Andres Garcia, the hotel’s executive director of horticulture. “That includes making sure the display reflects the authenticity of Chinese legend and, in this case, longevity and good fortune for the Year of the Rabbit." Not heading to Vegas? You'll also find Chinese New Year celebrations in these good luck cities. Seattle is among the cities that will begin its celebration of the Lunar Year on the weekend before Feb. 3, to allow as many people as possible to participate in the cultural activities. Activities include a food walk, lion and dragon dances, Taiko drumming, martial arts and a children's parade. Because 2011 is the Year of the Rabbit, “Children are invited to enter their pet rabbits in a contest for Rabbit of the Year,” said Youlee Wang of the Chinatown-International District Business Improvement Area. Thankfully, no such contest was held in 2010, during the Year of the Tiger. San Francisco’s Chinese New Year celebrations also begin this weekend with a ribbon cutting and flower fair filled with candy, fresh fruit, blooming flowers and other supplies with symbolic meaning for a new year. Entertainment will include traditional lion dancing, Chinese opera and martial arts demonstrations. 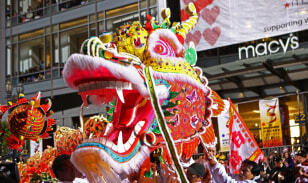 Events continue through Feb. 19, when the world-famous grand illuminated Chinese New Year Parade will roll out with extravagant floats, lion dancers, more than 100 marching bands and school groups, Chinese acrobats, plenty of firecrackers and a 250-foot dragon that must be carried by more than 100 people. Bonus: Anyone born in the Year of the Hare (1927, 1939, 1951, 1963, 1975, 1987, 1999 and 2011) gets free admission to Lunar New Year festivities at the San Francisco Zoo on Feb. 13. In New York City, a firecracker ceremony to ward off evil spirits and a festival filled with cultural performances and dances will take place on Feb. 3 in Manhattan’s Chinatown neighborhood. Floats, acrobats, performers, marching bands and lion and dragon dancers will take part in the annual Lunar New Year Festival and Parade on Feb. 6. And for the next few weeks, Chinese New Year events at the Museum of Chinese in Americawill include walking tours, lectures, special exhibits and a Lunar New Year Festival Family Day. Honolulu will host a Chinese New Year celebration complete with ethnic foods, martial arts demonstrations and entertainment in the Chinatown Cultural Plaza beginning on Jan. 29. The day ends with a parade that starts at the Hawaii State Capitol and includes various Narcissus Festival Queens and their courts, cultural organizations, lion and dragon dance associations and a 150-foot long dragon. An evening block party will continue the festivities with two stages of live music, more cultural performances and plenty of firecrackers. In Sydney, Australia, the Chinese New Year celebration kicks off Jan. 28 with the opening of New Year Markets featuring crafts and martial arts demonstrations, a karaoke competition and visits from dancing lions and dragons. The festival continues with Dragon Boat races and cultural events leading up to a spectacular Twilight Parade on Feb. 6 that ends with a huge fireworks show in Darling Harbor. Bonus: China’s Hubei province is sending a 250-member troupe to Sydney with floats, hip-hop artists, dragons and performers who will demonstrate Wudang martial arts (made famous by the film “Crouching Tiger, Hidden Dragon”) and the traditional Tujia Waving Hand Dance. Flower markets offering auspicious blooms and plants for the New Year kick off Hong Kong’s Chinese New Year celebration on Jan. 28. The city’s Chinese New Year night parade will take place on Feb. 3, with more than a dozen illuminated floats, performers from around the world (including cheerleaders and a choir from the U.S.), marching bands, street performers and traditional dragon and lion dancers. A spectacular fireworks display takes place Feb. 4 over Victoria Harbor. Those born in the Year of the Rabbit are said to be articulate, ambitious and lucky. So what better place to ring in the Chinese New Year than in Las Vegas?Through March 5, the Bellagio’s Conservatory & Botanical Gardensis displaying a symbolic and, of course, over-the-top Lunar New Year garden that includes a 35-foot Chinese Junk Boat with a 38-foot mast, a Ming Dynasty-styled gazebo and a 12-foot tall rabbit made with more than 4,500 live plants. Eight baby rabbits (so far), each made of 500 live plants, are in the garden as well. The Bellagio installation also includes oversized red-for-good-luck silk Chinese lanterns, an 18-foot-tall Chinese God of Prosperity and seven replica Terracotta Warriors covered in crushed walnuts and ground carrot seeds. Lucky for you, the exhibit is free and open 24 hours a day.